It took me a full day to get the roof framed…AND I had previously cut and marked the ridge beam and all of the full length rafters (ie those that didn’t intersect with a valley rafter. I knew the roof would be hard (because of the gable and valleys), but I didn’t think it would take a full day. 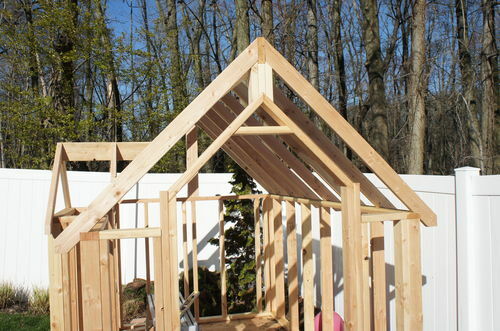 I have a book on framing, and it tells how to measure, mark and cut hip rafters and intersecting rafters. But after reading it twice, I decided it would be quicker and ultimately easier to just manually mark and cut everything with my own eyes, pencil and compass to scribe things. It seemed like the amount of trial and error it would take to get the proper technique would be more time that I was willing to spend. There weren’t many compound cuts needed, given how small the structure is. So I thought I could just use brute force to get through the tricky parts. I have a 12” dual bevel miter saw, and it came in extremely handy. In the seven years I’ve owned this saw, I think this is only the second time I’ve used it to make compound cuts. Go figure. I took me three tries to get the valley rafter cut properly. The hardest part was cutting the multi-dimensional bird’s mouth. 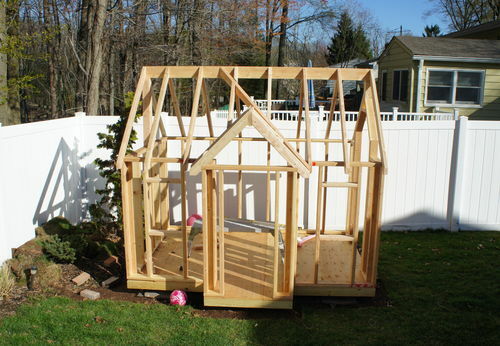 I know ideally the valley rafter should be two pieces of lumber sistered up, and it should be wider than 4” nominal. 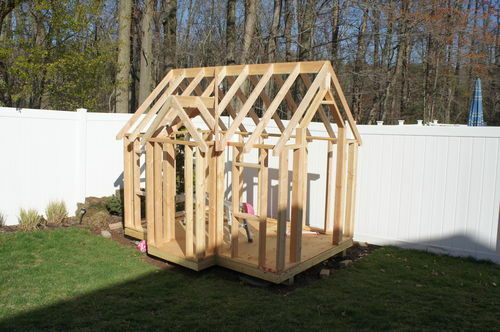 But again, considering the size of my structure, I thought a single 2×4 would suffice (all of my roof joists are 2×4s). Here’s my final roof framing. I’m assuming it is not exactly how a pro would have done it, but it’ll do. After seeing how tricky the valleys and surrounding joists were, I now have a new found respect for professional framers. I can’t imagine doing a huge house with a real elaborate multi-surface roof. Here’s a close-up of how I framed the wall that will have the adult-sized door in it. I don’t know if this is how a professional would have done it, but I think I schemed up a decent way to adequately support and carry down the load from the ridge beam. Any feedback from a pro on this would be greatly appreciated. I’m curious to see how else this wall could/should have been done.